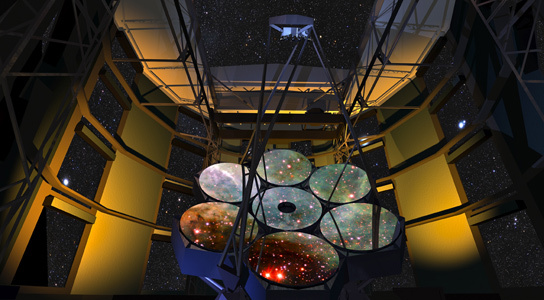 The Giant Magellan Telescope is designed to employ a series of seven 28-foot mirrors, which will be arranged in a honeycomb pattern. It will be able to compete with space-based telescopes like Hubble and Hershel thanks to adaptive optics, which have allowed ground-based telescopes to compensate for atmospheric distortions, thanks to the lasers and measuring the backscattering of the light. The 28-foot mirrors have just started being constructed this week. 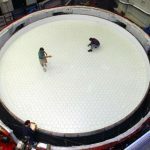 The resulting surface of the seven mirrors will emulate the capacity of a single mirror over 70 feet in diameter. In order to make each segment, 21 tons of borosilicate glass is dumped into a mold and heated up to 2,000 degrees. Once the glass starts to melt, the mold begins to spin, which causes the molten glass to flow up on the sides, forming a shallow parabola. Once the basic shape is established, the glass will be allowed to cool over 12 weeks. It will take seven more years of polishing to refine the optical surface to the required accuracy, which is about one-thousandth the thickness of a human hair. Adaptive optics use lasers or prominent light from nearby stars to measure the light’s backscattering. This in turn allows the mirror to be flexed so that it cancels out the distortion. This is cheaper than launching a telescope into space. Be the first to comment on "Giant Magellan Telescope Gets 7 28-Foot Mirrors and Adaptive Optics"